Starting Tuesday, November 1st at 10 PM/9C, A&E will present a new reality show called Random 1. Each week a team of five people will meet two strangers and find a way to make a positive difference in their lives. The Random 1 project started in 1996 when two friends, Andre Miller and John Chester, hit the road looking to meet strangers at random and make a difference in their lives. In 1999 they began filming their trips and by 2004 they had a support team of three and a high tech RV to help their random acts succeed. They consider themselves to be an Undercover Philanthropic Organization and Guerilla Philanthropists. They have also created an online Random 1 community called the Random 1 Transmitter. On this site you can listen to podcasts from their travels and join discussion boards where participants offer suggestions, resources and solutions for the Random 1 team. It could be really awful, but at least it has a positive premise. 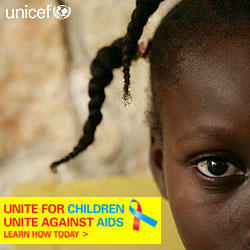 Unicef has launched a new campaign this month, Unite for Children, Unite Against AIDS. As part of the "What You Can Do" page on their site, they have links to donate money, sign up for an e-newsletter, download a banner to post in your email signature, blog or Web site, and download ringtones for your cell phone. How cool is that? Sadly my lame-o Verizon phone won't take ringtones other than the ones Verizon sells. Did you want to be Nicole Kidman in The Interpreter? Have you always wanted to work for the United Nations? Well, you can, in a manner of speaking, all from the comforts of your own home. You can join the online volunteer service branch of the United Nations Volunteers Program. Right now they have 154 virtual volunteer opportunities to choose from doing translation, research, web design, data analyses, database construction, proposal writing, online mentoring/tutoring, curriculumm development, publication design, and facilitating online discussions. The United States Holocaust Memorial Museum recently launched an online exhibit, Ripples of Genocide: Journey Through the Eastern Congo. The exhibit describes the devastation occurring in the eastern region of the Democratic Republic of the Congo (DRC). The site is an audiovisual journal created from Angelina Jolie's notes from her trip there in 2003, commentary by John Prendergast of the International Crisis Group and photographs by Ed Parsons and Laura Engelbrecht. A teacher's guide is included on the site as well. You can also download Jolie's narration and Predergast's commentary as a podast from the iTunes Music Store. This is the first year I will able to give out Halloween candy to children. In the past, I have lived in neighborhoods, like the Haight in San Francisco, where either very LARGE "children" came to my door asking for treats, or in neighborhoods where it wasn't safe to open the door. Now we live on the idyllic Oakland/Piedmont border in a house with a white picket fence (I am not kidding) and I am a gearing up for the kiddies to come knocking at the door in their little Harry Potter, Batman and Lindsay Lohan outfits. I am hoping to shoot over to the Global Exchange Store on College Ave. in Berkeley to buy some of their Fair Trade chocolate coin candy. If you don't live in the Bay Area, you still have time to order it online by going to Global Exchange's Fair Trade Online Store. Update 9/28/10: Here's a more recent post about Fair Trade chocolate, Nine Fair Trade Chocolate Bars. I just had to pass on the link to this cute organization I saw at the Craigslist Foundation Boot Camp a couple weeks ago, Realidate. I'm an old married lady now, but if I was out in the big bad dating world, I'd be signing up with a service like this. Basically, folks sign up to do service projects (like sort food at the Food Bank), or to attend nonprofit fundraisers (like a wine tasting to benefit a Boys and Girls Club), and have an opportunity to meet other realidaters looking to, "Find love . . . while making a difference." From my work with volunteer groups like One Brick and Hands On Bay Area, it is pretty clear that some flirting and socializing is happening during the group's project, but I like that Realidate puts it right out there, it is ok to do good and have a good time! In answer to readers' request for a subscription service to Have Fun • Do Good, I have set one up using www.feedblitz.com. After doing some research comparing www.bloglet.com and www.feeblitz.com, I think this will be the best service, but if you subscribe and find that annoying things are happening, please let me know by emailing britt@brittbravo.com. For example, bloglet subscribers were receiving drafts as well as the final posts of blogs. To subscribe to Have Fun • Do Good, just submit your email via the "Subscribe me!" box on the bottom of the right column. Feedblitz will send you an email with a confirmation link that you need to click on. If you have a Hotmail account, sometimes it puts the feedblitz emails in your junk or spam box, so check those and add "feedblitz@mail.feedblitz.com" to your list of permitted senders. Once you are subscribed, you will receive an email of each new posting. If you have a lot of blogs that you are watching (and they don't have email subscription services), I suggest using www.bloglines.com. You can watch as many blogs as you want and set up a Bloglines icon on your desktop that will notify you when the blogs you like are updated. Yesterday I went to the San Francisco session of the second annual Craigslist Foundation Nonprofit Boot Camp. In case you've never heard of craigslist, it's this awesome free online classified web site that has listings for cities all over the world. Although the Foundation is going to make transcripts of all of the sessions available and I believe video from the conference will be broadcast on www.ibaglobal.com as well, some people on a list serv that I am on, Young Nonprofit Professionals Network (YNPN), wanted to share notes virtually so I decided to post some of my notes here. My notes won't be transcriptions, but more about things that stood out for me. 1. You need to determine what your communications infrastructure looks like. How many staff do you have to work on communications? How much money? Who does the staff know? What coalitions is the organization a part of? Who are the organization's constituents? Do you have total organizational buy-in? 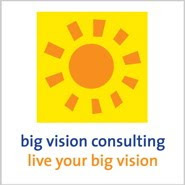 How strong is your organization's "brand"? What kind of knowledge does the staff already possess? Answering all of these questions will help you to determine the amount of time, energy and resources you can devote to your plan. 2. Establish you goals. Your communication goals need to be specific, measurable and based on the capacity of your infrastructure. 3. Target your audience(s). You campaign target is the person who has the power to give you what you want. The target audience is the people who can influence your campaign target. The secondary target audience is the people in the community who ought to know about you to build power and brand for your group. 4. Frame the issue. What is the angle you are going to take when speaking with your audience that is compelling and newsworthy? 5. Discipline the issue. What are the actual words you are going to use to communicate your message? 6. Identify your news and opportunities. You shouldn't only target the biggest newspaper in your area. Take smaller, easier opportunities as well. 7. Create your communication tactics such as your web site, brochure and press releases. None of these things should be done BEFORE a communication plan is completed. The other point that he made over and over again was to talk to strangers to get the word out and to do research about your target audience. The next session I went to was Building the Local Green Economy presented by Kevin Danaher, co-founder of Global Exchange. One of the most exciting things he talked about is the creation of a Global Citizen Center in downtown San Francisco. The center will be a large, mixed-use building that will serve as a hub for ecologically and socially responsible enterprise, education, and economic development. It will be redesigned as a green building and have offices for like-minded nonprofits such as Global Exchange and Mother Jones, affordable housing, event space, a Green-mart showroom, retail space and a digital broadcasting studio. The overall theme of the lecture was that it is time for the progressive movement to start attracting people with their solutions and what they are saying yes to, rather than what they are against. Many of the solutions that are being offered are based on looking at how nature does something so that we can learn how to do the same thing. We need to create a honeybee economy that makes honey (money) by helping the flower, not hurting it. Ecology of Commerce by Paul Hawken (I read this years ago. It is a GREAT book). 1. The progressive movement is learning that merely protesting is not enough. We need to create positive creative alternatives. He used the metaphor of the Titanic. Which is more appealing to tell people that they are on the Titanic and it is sinking, or to sail by in a boat that is green, with great food and fun music and ask them to come on board. 2. Socially screened funds are starting to shift money from traditional equity and debt instruments to real estate and green building investments, especially when it benefits nonprofit social justice and environmental groups. 3. Within the nonprofit community, the techniques of enterprise are gaining widespread acceptance and increasing sophistication. 4. The general collapse of biological systems around the world is causing more and more people to realize the urgency of a transition to conservation economics. 6. City governments are increasingly passing laws to strengthen the local, green economy. 7. Green economy sectors (solar, wind, organic, recycled) are increasingly price competitive and popular. He mentioned Aerotecture as a company that has created a bird friendly alternative to propeller windmills. 8. Green building is spreading widely in the construction industry and its price competitiveness is improving. 1/3 of the money given away will be received by religious organizations because they ask their most faithful, loyal people the most often, and because they ask as if they are doing you a favor by asking you. People will pay you to do the work that they think needs to be done, but that they can't do themselves. middle class and poor people). don't want a donation. You want a donor. 4. Organizations need teams to raise money, not just one person. 5. Don't promise something on the front end that you can't deliver on the back end. are going to say no and half the people you ask will give less then you asked for. you less than $1,000 and one will give you $1,000. going to give their money away, they will just give it to someone else. The one idea that stuck out for me from the panel was the answer to the question, "How do we recruit more men?" Tshaka Barrows from Community Justice Network for Youth recommended determining who the natural male leaders are in the community you are trying to recruit from and to start with them first and/or cultivate leadership among males who are interested. Be aware that culturally, men are expected to be providers and low or non-paying nonprofit jobs don't meet that expectation. The best way to recruit more men into a movement are to listen to them, gain their respect and build relationships with them. The final workshop I attended was Volunteerism Recruitment and Management. Although I already work as a consultant to help nonprofits develop their volunteer programs, I always think it is good to learn about what other folks are doing. Dave Shefferman co-Founder of One Brick. Heyman mainly talked about recruiting volunteers to produce the conference. When he recruits he uses a "low touch, high value" model. He finds the most accomplished, talented people to help produce, promote and curate the conference, and asks them to make a large impact in a short period of time (2-5 hours per month) so that volunteers feel like they get a "return on their investment." He tried to build the 80-person steering committee for the conference by creating volunteers' roles around their dream jobs and what would be fun for them. Finally, he had regular meetings of the committee to create community among the volunteers. Shefferman spoke about the importance of removing as many barriers to volunteering as possible. In the case of One Brick, it provides opportunities for volunteers who can't volunteer regularly and who don't know what opportunities exists. One of the things that makes One Brick such a success is that the networking and social aspect of its volunteer work. Almost every volunteer project is followed by an after party at a restaurant or bar which builds community within the One Brick volunteer community, and its fun! Morrison and her team at Project Open Hand manage 900 plus regular volunteers and 3700 one-time volunteers to deliver 2500 meals each day to the critically ill and elderly. When setting up a program, have all your "ducks in a row" before you start recruiting, including volunteer job descriptions and schedules, training materials and procedures, volunteer standards of conduct, applications, contracts and agreements, and any other steps necessary to protect the organization's liability. She stressed the importance of communicating the organization's mission and the organization's expectations of the volunteer from the very beginning. Project Open Hand has a 45-minute orientation every Wednesday night at 6 PM where volunteers learn about volunteer opportunities and requirements. If they are still interested in volunteering, they fill out an "Intent to Volunteer" card. A staff member calls them after the orientation to set up a time for them to come in for training. Trainings are 1 hour at 10 AM on Saturdays. The volunteer is scheduled to come in for the next upcoming shift after their training. They offer a variety of opportunities with different schedules. Each volunteer receives a volunteer manual which includes job descriptions of each opportunity, how to do their job and the organization's expectations. They sign a sexual harassment policy document, fill out a demographic profile, and sign an agreement between themselves and Project Open Hand. If a volunteer does not meet the organization's expectations, she lets them go. To appreciate her volunteers she makes sure that staff members in all departments thank them (not just the people in her department), she sends out birthday cards to volunteers and has a thank you party every year. Instead of having a "Volunteer of the Year", she has buttons made that say the number of years each person has been volunteering and they receive the button at the annual appreciation event. The average volunteer works at Project Open Hand for 4.7 years. Fill Up America is a group of friends who deliver 150 bags of food to individuals and families once a week. Boshnack talked a lot about doing service for service sake and that his organizations' focus is really about bringing joy to their volunteers, rather than the people they serve. The mission of their group is to build community, have fun and to be of service. Someone mentioned, Project 20, the San Francisco Department of Parking and Traffic's program that allows people to work off their tickets through community service, although their guidelines have changed a lot and they like people to do most of their service for the city now. There was also a discussion of database software. One Brick has created their own software and Project Open Hand uses VolunteerWorks. (FileMaker Pro has worked well for me). I couldn't find it on the site, but apparently the Volunteer Center has some free volunteer management software nonprofits can use as well. Whew! That's it. I hope these notes are helpful, and if you have any questions, feel free to email me at britt@brittbravo.com. I have been vegan, vegetarian and macrobiotic. I have also been someone who will eat meat, but not dairy; someone who will eat meat, but only in restaurants; and most recently, someone who eats everything. But sometimes I have animal product guilt and go through periods of cooking vegan/vegetarian. We recently had some friends stay with us who are vegan. I wanted to have food that they would be comfortable eating, so I went out and bought a new vegan cookbook, How it All Vegan! by Tanya Barnard and Sarah Kramer. Vegan cookbooks sure have gotten better since I was cooking in the early nineties with The Cookbook for People Who Love Animals (blech). I made them some vegan cupcakes that were ok. The frosting was very good (recipe below), but the cupcakes tasted more like molasses muffins. In the end it turned out that my friends hadn't been vegan for years and they ended up eating the regular cupcakes I'd made instead. Since then, I have made some good recipes from the book including "Tanya's Asian Creation" which I've included below and "Classic Chocolate Chip Cookies" which I made today for a friend's birthday, also below. So, if you are a recovering vegan/vegetarian who suffers from animal product guilt once in a while, I recommend How it All Vegan! I'd say 80-85% of the recipes are good and can be fed to vegans and non-vegans. In a small saucepan, whisk together the water and the flour constantly over medium heat until thick (about the consistency of glue). Be careful not to burn it! Once thick, remove from heat and cool off completely by setting the pot in a slightly larger pan of cold water, or a sink with a bit of cold water. While it's cooling, in a medium bowl, mix together the sweetener, vanilla, margarine, and coca powder until well mixed. Add the cooled flour mixture to the bowl and stir together until there are no lumps. Let cool in the fridge for 30-60 minutes--before using. Braggs Liquid Aminos as garnish (Vegans love this stuff. You can also use soy sauce). Gomashio as garnish. (The book has a recipe of gomashio with kelp powder, but Eden has a very tasty pre-made gomashio that I used instead). In a medium pot, boil the noodles in water on high heat. Meanwhile, in a medium saucepan, saute the squash in the oil on high heat for about 5 minutes, then add the tofu, pepper and salt. Continue cooking until the squash can be easily pierced with a fork. Add the onions, cover and set aside. When the noodles have finished cooking, rinse in hot water, then place back in pot and toss with flax oil to prevent the noodles from sticking. Place them in a bowl or on a plate and top with the squash mixture, then garnish with Braggs and gomashio. Makes 2-4 servings. 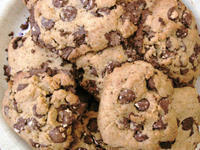 1-1 1/2 cups chocolate chips (I used the whole 10 oz bag of Sunspire Grain Sweetened Chocolate Chips). Preheat oven to 375 degrees. In a small bowl, stir together the sweetener, margarine, oil, water and vanilla. In a large bowl, mix together the flour, baking soda, and salt. Add the margarine mixture and the chocolate chips and mix together well. 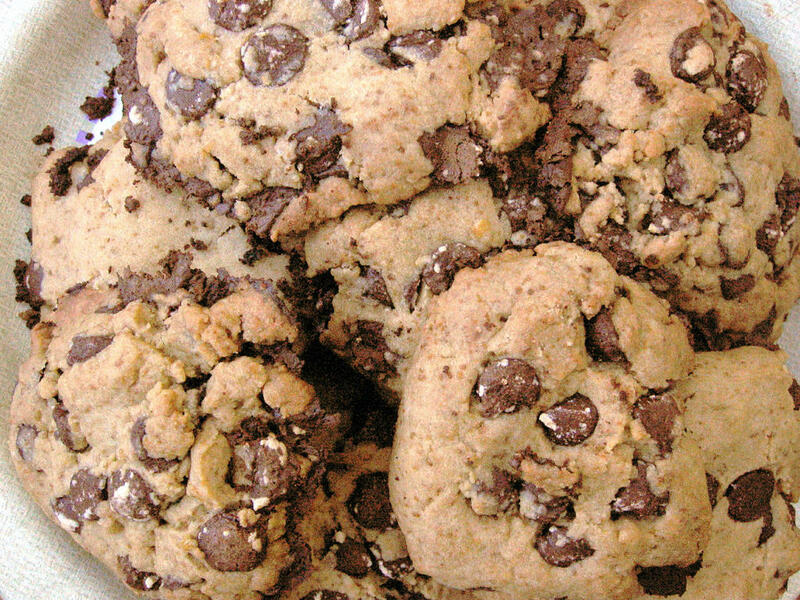 Scoop spoon-sized portions onto an unoiled cookie sheet and bake for 8-10 minutes or until the edges are browned. Let cool before removing from cookie sheet. Makes 6 large or 12 small cookies. (I found that it made 18 medium cookies).